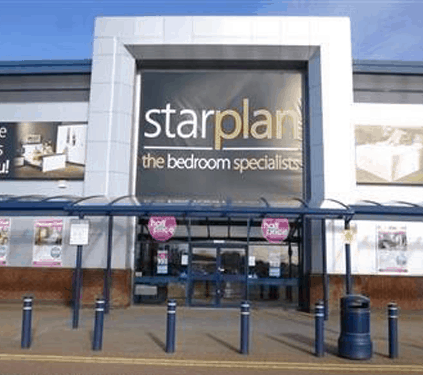 Starplan has been in the fitted bedroom Bolton industry for over 40 years, and thanks to that time and experience, we know we can provide you and all of our customers with the highest quality bedrooms. 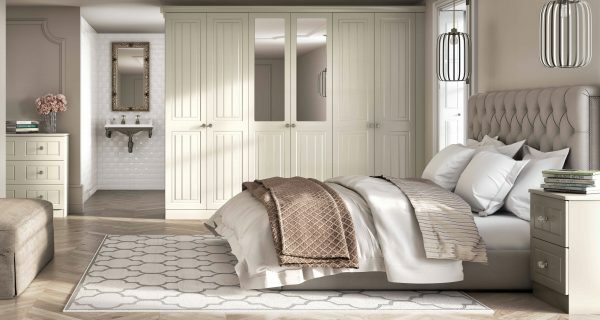 All our fitted bedrooms Bolton are measured and fitted by our professional team, and as we offer a bespoke service, everything is manufactured to your needs and specifics. Address: Middlebrook Retail & Leisure Park, Horwich, Bolton, BL6 6JA. We understand that a bedroom is a space that is unique to you. This is why we offer a fitted bedroom Bolton service, for free! Our design experts can take your bedroom measurements, no matter how awkward and thanks to our in-store 3D design computer, they can create your dream bedroom. If you need some home inspiration, why not take a look at our online colour visualiser? You can choose from traditional, modern or even children’s bedrooms! It will even let you mix and match with different colours and bedroom finishes. The perfect tool to get your creative juices flowing. Once you have your home inspiration, let our brilliant design team do the rest. Our fitted bedrooms Bolton showroom is based on Middlebrook, Horwich. However, our fitting team cover all Bolton districts including Westhoughton and Blackrod, Farnworth and Kearsley. Plus, Turton, through to Belmont and Edgeworth to mention a few. With over 30 styles available in the oak fitted bedrooms Bolton range. It’s well worth a visit to our Bolton fitted bedroom showroom. Where you can choose from cool, wood tones and minimal, classic cuts. There is nothing shabby about this beautiful range of fitted bedrooms Bolton. Check out these porcelain units in our Bolton store. The first step to create a traditional yet Stylish bedroom. A strong modern fitted bedrooms Bolton style with Scandinavian references. This stylish bedroom is on display in our Bolton Showroom. Create a bedroom to grace the pages of any home interior magazine. 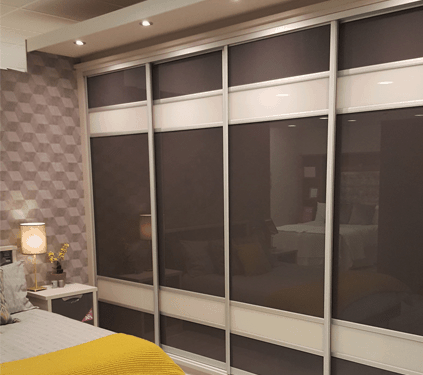 High Gloss Fitted Bedrooms Bolton available in multiple colours to create a sophisticated fitted bedroom that is easy on the eye and yet has loads of practical storage solutions too. 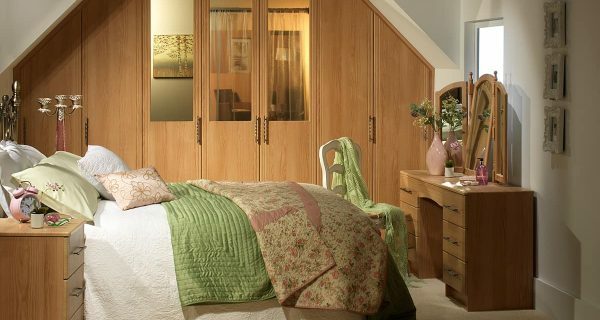 The mellow gold tones of American Cherry fitted bedrooms Bolton will create warmth & sophistication. Choose a fitted bedroom that is elegant and to be enjoyed on lazy mornings. Choose our range of Traditional Bedrooms Bolton. Create hotel-style chic to be enjoyed in your bedroom. 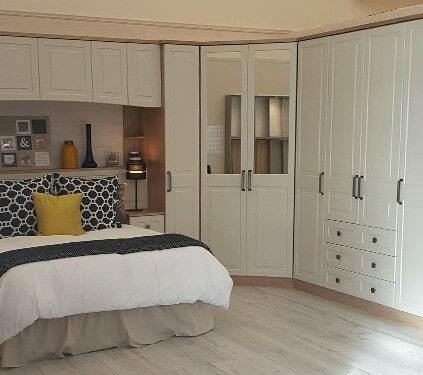 Our Bolton bedroom showroom can great ideas to create a touch of luxury. Clean white fitted bedroom Bolton are ever popular and create a beautiful contrast to a bedroom décor. Our Bolton bedroom showroom display inspire the New England look and feel. 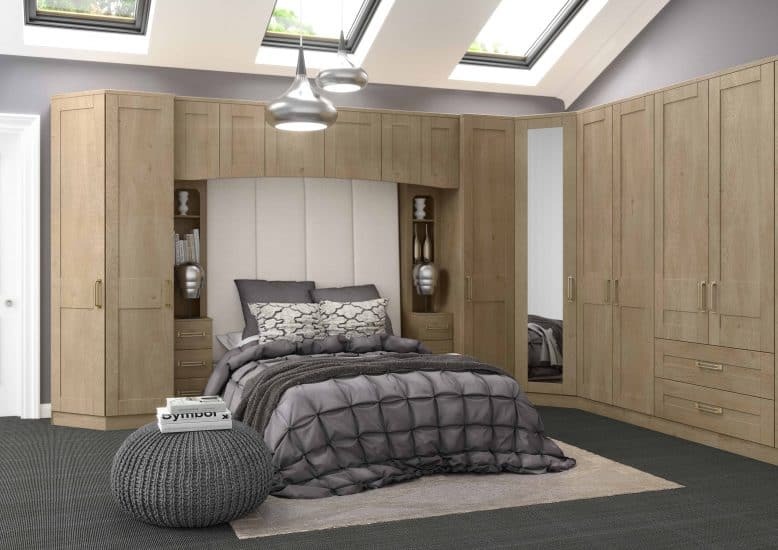 Cool, Calm and Collected that’s our Maple Fitted Bedrooms Bolton range. Our Bolton bedroom showroom displays how you can organise your home and work life with a fitted bedroom or office. Nothing beats a walnut Fitted Bedrooms Bolton for its deliciously rich, dark finish. 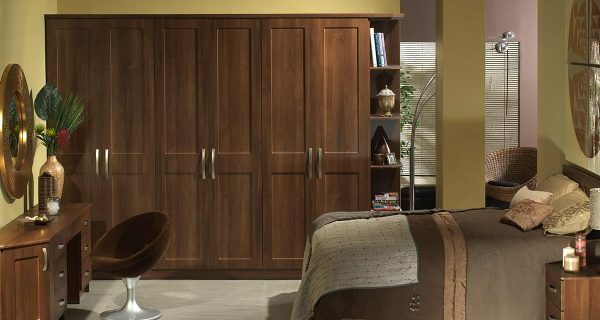 Our Bolton bedroom showroom showcase rich chocolate bedroom colours, leather accessories and bedroom furnishings for a visual feast.